Canadian exports fell 2.9% in November, mainly on lower crude oil exports, while imports decreased 0.5%. 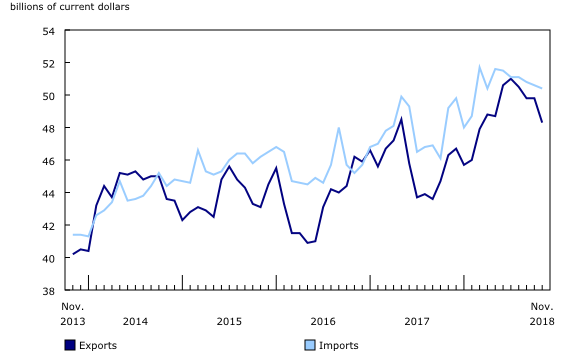 As a result, Canada's merchandise trade deficit with the world widened from $851 million in October to $2.1 billion in November. Total exports fell 2.9% to $48.3 billion in November, a fourth consecutive monthly decline. Export volumes were down 1.8% while prices fell 1.1%. Exports were down in 8 of 11 sections in November and, as was the case in October, energy products contributed the most to the decline. Exports excluding energy products decreased 1.4%. Following a 6.7% decline in October, exports of energy products fell 9.2% to $8.4 billion in November. Crude oil exports (-17.7%) led the decrease, driven by a 13.9% drop in prices, which were down for a third consecutive month. Crude oil export volumes were down 4.4% in November. Lower exports of crude oil were partially offset by higher exports of coal to South Korea, China and Viet Nam. Exports of basic and industrial chemical, plastic and rubber products also contributed to the decline, falling 7.5% to $2.8 billion in November. The decrease was driven by a 26.4% drop in exports of lubricants and other petroleum refinery products, mostly on lower exports of motor gasoline blending stock to the northeastern United States. Exports of forestry products and building and packaging materials (-5.7%) were also down in November, primarily due to lower exports of pulp and paper (-10.1%). Despite the decline in November, the year-to-date cumulative value of pulp and paper exports was 18.2% higher compared with the same period a year earlier. Total imports declined 0.5% to $50.4 billion in November. Imports were down in 7 of 11 product sections, led by motor vehicles and parts. Import volumes fell 0.3% and prices edged down 0.1%. Year over year, total nominal imports were up 2.4%. Imports of motor vehicles and parts decreased 2.8% to $8.9 billion in November. Lower imports of passenger cars and light trucks, which fell 5.5% to $3.7 billion, were mainly responsible for the decline in November. This was the 9th decrease in 12 months, with imports of passenger cars and light trucks down 13.9% compared with November 2017. This decrease coincided with lower demand for new motor vehicles in Canada in recent months. Imports of metal ores and non-metallic minerals fell 18.6% to $1.1 billion in November. Following a record high in September, imports of other metal ores and concentrates (-19.6%) were down for a second consecutive month in November, mainly on lower imports of gold for refining from the United States. The overall decrease in November was largely offset by higher imports of aircraft and other transportation equipment and parts, which rose 21.2% to $2.1 billion. After reaching a five-year low in the third quarter of 2018, mainly due to a temporary slowdown in aircraft production in the United States, aircraft imports were up for a third consecutive month in November, mainly on the strength of higher imports of airliners. Exports to the United States fell 3.9% in November to $35.3 billion, mostly due to lower crude oil exports. Imports were down 0.3% to $33.2 billion. As a result, Canada's trade surplus with the United States narrowed from $3.5 billion in October to $2.2 billion in November, the smallest surplus since September 2017. Comparing the average monthly exchange rates, the Canadian dollar lost 1.1 US cents relative to the American dollar from October to November. Imports from countries other than the United States fell 0.8% to $17.2 billion in November, a third consecutive monthly decline. Lower imports from Russia (crude oil), Switzerland (copper) and Mexico (passenger cars and light trucks) were partially offset by higher imports from China (computers) and Japan (gold and passenger cars). Exports to countries other than the United States edged up 0.1% to $13.0 billion. A sharp increase in exports to the United Kingdom (gold) was almost entirely offset by lower exports to Hong Kong (gold), the Netherlands (iron ore and heavy fuel oil) and China (gold). 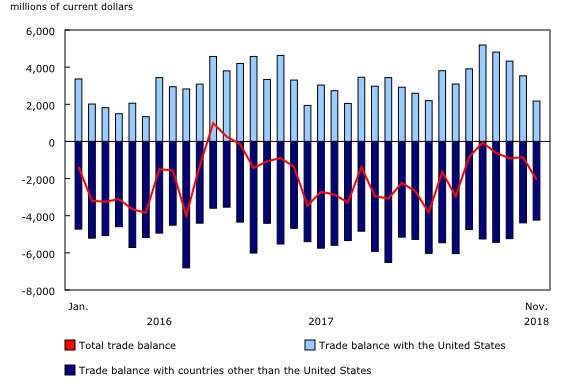 As a result, Canada's trade deficit with countries other than the United States narrowed from $4.4 billion in October to $4.2 billion in November, the smallest deficit since December 2016. Revisions reflect initial estimates being updated with or replaced by administrative and survey data as they become available, as well as amendments made for late documentation of high-value transactions. Exports in October, originally reported as $49.3 billion in last month's release, were revised to $49.8 billion, mainly on revised exports of crude oil. October imports, originally reported as $50.5 billion in last month's release, were revised to $50.6 billion in the current month's release. Under a 1990 agreement between Canada and the United States, each country uses the other's import data to produce statistics on its exports. On December 22, 2018, a partial shutdown of the US federal government came into effect, resulting in the closure of the United States Census Bureau. For the duration of the shutdown, Statistics Canada will not receive data on Canadian exports to the United States. While this disruption does not affect data for the current release (November reference month), a continued shutdown could prevent Statistics Canada from publishing a complete picture of Canadian international merchandise trade statistics for the December 2018 reference period on February 5, 2019. Statistics Canada will continue to monitor the situation and will provide further information to users as it becomes available. Real-time table 12-10-0120-01 will be updated on January 21, 2019. Data on Canadian international merchandise trade for December 2018 will be released on February 5, 2019.